After a nearly-15-hour filibuster on the Senate floor, Democrat senators said they got a commitment from Senate Republicans to hold a vote on amendments that include expanded background checks and a ban on gun sales to suspected terrorists. The filibuster came three days after 49 people were killed in a terror attack at a nightclub in Orlando, Florida. The attacker, Omar Mateen, had been added to a government terror watchlist in 2013 when he was being investigated by the FBI, but was cleared from the database 10 months later when the investigation ended. By Senate rules, he had to stand at his desk to maintain control of the floor, and showed little sign of fatigue as the night wore on. Democratic Sens. Richard Blumenthal (D-Connecticut) and Cory Booker (D-New Jersey) stayed with Murphy on the floor for most of the debate. Other Democrats joined in to give speeches. Murphy finally yielded the floor at 2:11 a.m., ending his stand with a story of a young boy who was killed in the Newtown school shooting in his state in 2012. Twenty children and six educators died in the mass shooting at Sandy Hook Elementary School on Dec. 14, 2012. “For those of us that represent Connecticut, the failure of this body to do anything, anything at all in the face of that continued slaughter isn’t just painful to us, it’s unconscionable,” Murphy said. 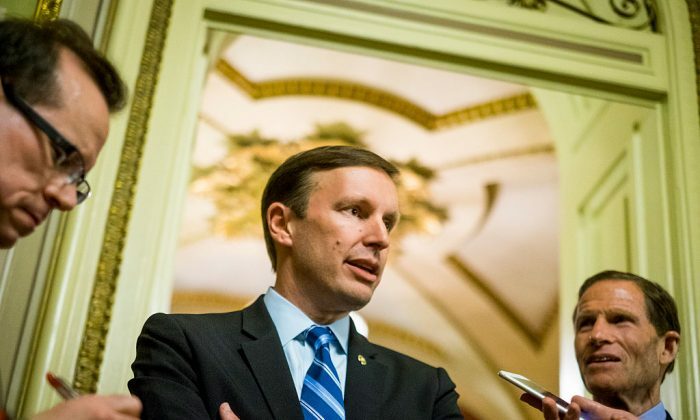 Murphy and his colleagues ended the filibuster after getting assurance from Republican Senate leaders that a vote will be held on legislation proposed by Sen. Dianne Feinstein (D-California). The legislation is similar to amendments proposed last November by Feinstein that would let the government bar sales of guns and explosives to people it suspects of being terrorists. In December, the Republican-controlled Senate voted against the proposal 45-54, almost entirely along party lines. Republicans have argued that Feinstein’s bill denies due process to people who may be on the terror list erroneously and are trying to exercise their constitutional right to gun ownership. Republican Senator John Cornyn from Texas proposed an alternative bill last November that would allow the government to delay firearms sales to suspected terrorists for up to 72 hours. Cornyn’s bill has been supported by the National Rifle Association. On Wednesday the group stated their willingness to meet with presumptive nominee Donald Trump over the legislation. Democrats and gun activists have rejected Cornyn’s amendment, arguing that the requirement of convincing a judge to block the transaction would be too lengthy a process and not effective in stopping gun purchases by suspected terrorists. The vote on the amendments could be as early as Thursday afternoon but is more like to place early next week according to Politico. Trump took aim at Clinton's gun stance in his speech to the NRA saying she wants to make neighborhoods less safe by disarming citizens.